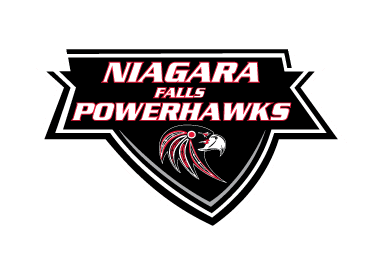 The Niagara Falls PowerHawks were swept by the Binghamton Junior Senators for the second straight weekend, showcasing why Binghamton is one of the top teams in the NA3HL. In Saturday’s contest, the Junior Senators skated away with a 13-3 victory at the Ice House Sports Complex. The first period was scoreless until 16:48 when Mike Padgeon scored for Binghamton with Rory Gresham assisting. Niagara Falls, not wanting to fall behind as in previous games struck back only 49 seconds later to tie the game off the stick of Jared Hayden. Tristen Mock recorded the assist. Marcus Cook gave Binghamton the lead back with six seconds left in the period. Zach Bell was the lone assist on the play. Binghamton jumped out to a 3-1 lead 32 seconds into the second period. Nico Corsaro was assisted by Eric Melso. Staying in the game, the PowerHawks swooped in for their second goal 44 seconds later. Devin Johnson notched the goal with Dominic Cappella on the assist. Riley Botting extended the lead for Binghamton at 3:01, with Aleksander Conrad on the assist. Niagara Falls struck again to keep the game in reach when Tristen Mock scored on the power play at 11:32. Nolan Mages and Hayden provided the assists. Binghamton then took control of the scoring for the evening and didn’t let up. Zach Bell grabbed the next two goals. The first, at 13:29, was assisted by Greg Simmons and Dinmukhamed Dzhangareshev. The second was a power play goal, assisted by Marcus Cook at 16:51. Wyatte Roberts was the next skater from Binghamton to find the back of the net. Roman Boffa assisted on the goal at 17:37. Dzhangareshev kept the pressure on with a power play marker at 18:36. Gresham assisted. Cook scored 14 seconds later for the Junior Senators to finish the second period with the home team leading 9-3. The third period was all Binghamton on the scoresheet with four quick goals to start the period. All four goals were scored within the first five minutes of the frame. Cook scored unassisted at 1:05 to record a hat trick. Simmons added his own goal exactly one minute later, with Will Darling assisting. Sixty-four seconds after Simmons’ goal, Conrad lit the lamp with Dzhangareshev assisting. Corsaro closed out the scoring for the night at 4:32. Melso and Padgeon were credited with the assists. Jonathan Rapp picked up the win in net for the Junior Senators, stopping 14 of 17 shots through two periods. He was replaced by Thomas Sullivan for the third period, who stopped all ten shots he faced. Josh Mitchell turned away 47 of 58 shots faced. He was replaced by Jonathan Sebastiano for the final 2:23 of the second period. He stopped 2 of 4 shots. Mitchell returned to the net for the third period. Next up for the PowerHawks is another road trip September 29th and 30th to face the Cape Cod Islanders at the Falmouth Ice Arena. The next home games for Niagara Falls will be October 19-21 at the Hyde Park Ice Pavilion. Their opponents on the 19th will be the Skylands Kings at 8:30pm. The Binghamton Junior Senators will visit on the 20th and 21st, with game times set for 6pm and 12pm respectively.